* Six years after the Phillies left. (Parentheses): Estimated dimensions; distance to true power alleys not marked. BEEN THERE (too late): I paid a visit to the site of Shibe Park / Connie Mack Stadium on September 4, 2016, and attended a service at Deliverance Evangelistic Church, which now occupies that plot of land. * The Phillies won the NL pennant in 1950; all other World Series appearances were by the (AL) Athletics. Like most of the Early 20th century ballparks, Shibe Park was laid out on a rectangular street grid that imposed no unusual constraints on the shape of the outfield. It resembled most closely Sportsmans Park, but also shared with Ebbets Field the characteristic of double-decked stands in left field and an open right field. Named for Ben Shibe, one of the Athletics' owners, it was renowned as a first class ballpark and was the first true modern stadium of the 20th century, constructed entirely of concrete and steel. Although ordinary in terms of the nearly symmetrical field dimensions and perpendicular angles, it did have unique architectural details such as columns along the outside of the grandstand, as well as a tower topped off by a cupola, where the executive offices were located. The elaborate design and features were fitting, as the Athletics were among the greatest teams in baseball under manager (and part owner) Connie Mack, a.k.a. Cornelius MacGillacuddy), and they played in three straight World Series from 1929 to 1931, winning the first two. But because of the Great Depression, they had to sell their best players, and the franchise began a long decline. Not until 1972 did the Athletics return to the World Series, and by that time they were in Oakland. Originally, the Shibe Park grandstand was double-decked around the infield, and uncovered pavilion sections extended down to each foul pole. This was typical of ballparks built before World War I. Originally, the scoreboard was in the left field corner, several feet in front of the perimeter wall. In 1913 (or perhaps 1910), the pavilions were roofed, and bleachers were installed in left field, extending to within about 50 feet of the wall on the right side of center field, where the scoreboard was moved to. In 1913 or thereabouts, the small gap between the bleachers and the pavilion was closed off by a very short (three feet?) fence or wall, which extended on the opposite side of the bleachers to the 20th street on the northeast side. The unusually long distance to the corner just left of center field -- about 509 feet -- was deduced from geometry. It was originally about 72 feet to the backstop, increasing to about 85 feet in 1913 or so, when the diamond was moved forward about 13 feet. This reduced the original left field and right field distances (LF 378 and RF 340 feet) to 334 and 331 feet, respectively. Those dimensions remained virtually intact for almost the entire remainder of Shibe Park's existence. Originally, there was a gradual slope from left field to deep center field, but this was apparently flattened in 1923, when the first six rows of the bleachers were removed, causing the wall in front of the bleachers to become higher. For the rest of Shibe Park's history, a slight rise remained in deep center field. The shrinking of the bleachers raised the distance to left field by about 18 feet, resulting in fewer home runs. After the 1925 season, the upper deck of the grandstand was extended to both corners, and the roof in this section was at least ten feet higher than the original portion of the grandstand. Interestingly, the extended portions of the upper deck were parallel to the foul line, not the lower deck, and then they bent inward at a 45 degree angle, forming a partial octagon. This was a distinctive architectural feature of Shibe Park, later emulated at Citizens Bank Park. A substantial amount of foul territory was actually covered by the upper deck near the corners, and a tiny amount of fair territory in the left field corner was covered. At the same time, an upper deck was built above the left field bleachers, but he roof was more than 20 feet lower than the adjoining grandstand roof. From 1926 through 1929 the distances to the corners were reduced to 312 feet (left field) and 307 feet (right field), as home plate was apparently moved about 65 feet (!) forward, creating a backstop distance of over 120 feet! There was a "return to normalcy" (dimension-wise) in 1930, as home plate was moved back about 32 feet, after which the outfield dimensions remained quite stable. (???) It is not certain why the "400" and "405" distance markers were placed so close to center field, rather than in the power alleys, other than to make way for advertising signs and the scoreboard. In 1929, press boxes and elite seating were installed above the upper deck, as the original roof was raised slightly above the roof on the extended portion of the grandstand. Also, a tiny "mezzanine" level was squeezed in above and behind the lower deck, but fans sitting there couldn't see fly balls, so it was more or less abandoned. In 1935 the Athletics built a huge corrugated metal wall in right field to stop freeloading neighbors from watching games for free. This was during the Depression, and the team needed all the revenue it could get. With the addition of lights for night games in 1939 came two large protrusions in the right field wall, where the light towers stood. In 1949, the lower deck of the grandstand beyond the infield was rebuilt on both sides so that the rows of seats toward the farthest ends faced toward the diamond rather than toward center field. This was just like they did at Wrigley Field at about the same time. The amount of "covered" foul territory shrank after this alteration, and the bullpens were moved to the narrow "alleys" between the foul line and the grandstand. There was a proposal to add bleachers in right field during the late 1940s, but nothing came of this plan. CINEMA: Shibe Park made an appearance in They Learned About Women (1930), and had "bit parts" in other movies. In July 1938 the Phillies abandoned the dilapidated Baker Bowl (just a few blocks away), and moved into Shibe Park as tenants of the Athletics, who had already built separate locker rooms and office facilities in hopes the National League team would "cohabitate" and share living expenses. The two teams shared the stadium for 17 years. (See Anomalous stadiums, shared.) The only year the Phillies made it to the World Series during the 32 years they played here was in 1950, when they lost to the Yankees. In 1950 a fence was installed in center field to keep the batting practice backstop out of play. For the next few years, this fence was shifted back and forth, settling down at 447 feet in 1956. That was the year a big new scoreboard (similar to the one from Yankee Stadium) was installed in right field. Two rows of box seats were added around the infield in 1956, reducing the distance to the backstop from 85 to 78 feet, and four more rows were added in 1960, further reducing the distance from 78 to 68 feet. The dugouts were moved forward about 10-12 feet at this time. In 1969 the center field fence was moved in, so that the distance for the final two years of the stadium's useful life was 410 feet. The Philadelphia Eagles used Shibe Park as their home field in 1940, 1942, and from 1944 until 1957, after which they took up residence in the University of Pennsylvania's Franklin Field. See Football use. 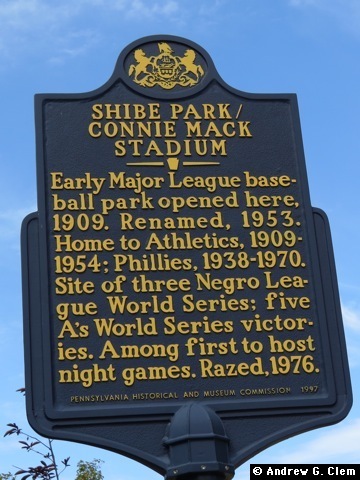 In 1953, soon after Connie Mack retired, Shibe Park was renamed in his honor. Two years later he and his family sold their beloved Athletics, who then left town and headed west to Kansas City. With hardly any parking in the neighborhood, this grand old ballpark's days were numbered, and the Phillies moved into the huge Veterans' Stadium in 1971. Connie Mack Stadium was damaged by fire in 1971, and was finally demolished in 1976. Deliverance Evangelistic Church now stands on the site, which is appropriate for such a "green cathedral." #1 Shibe Park historical sign, in front of Deliverance Evangelistic Church. #2 Closeup of entry to Deliverance Evangelistic Church, Shibe Park historical sign. #3 Deliverance Evangelistic Church, Shibe Park historical sign. NOTE: The diagram thumbnails have been continually replaced since 2008, so the images seen in the older blog posts do not reflect how the full-size diagrams looked at that time. Roll your mouse over the above thumbnail to see a pre-2008 version.